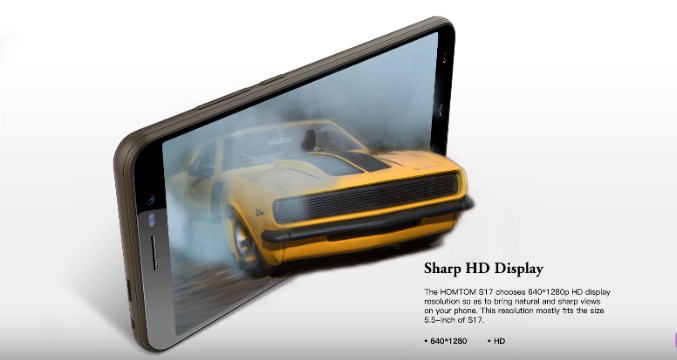 Homtom S 17 4G phablet. 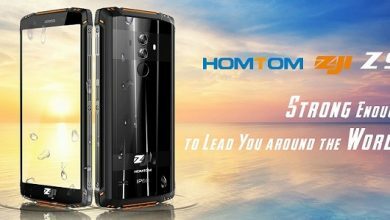 Homtom brand is a very professional brand with its regard, and this brand has just released a mind bobbling smart phablet named as HOMTOM S 17. This smart phablet has entered another level of production. The looks of this phablet are quite impressive. It has a slim body whose dimensions are 159.33 x 71.68 x 8.75 (in mm). This phablet comes with a metal body which makes it strong and durable. It also adds a metallic shine to it which is an add-on to the looks. It comes in two color variants- Gold, and Black. These all are amazing colors. The color choices give excellent options to color perfectionists. Being a metal body phablet is quite heavy. It weighs 195 grams. But it is easy to carry and use. The camera and fingerprint sensors at the back are placed well and give it a handy grip. Being a phablet it is still very good to carry on with people, and the size is quite right and convenient. 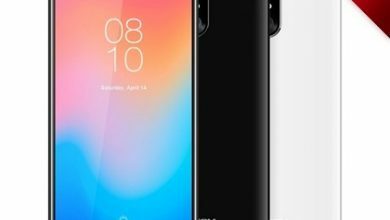 The camera placed at the back gives the phablet quite good looks in design, even the edges of the phablet are round and sleeky which makes the user handle it and increases the beauty of its look. The Homtom S 17 comes with a 5.5-inch touchscreen display, IPS,640×1280 pixel,24. And why it is right? Because it has a fantastic 640x1280pixels resolution. That’s right. You can play high definition movies and videos on this phablet. It has a top 19:9 aspect ratio. And this phablet gives you 640 PPI (Pixels per inch) support. That means you are going to have an excellent gaming experience, movie nights and you will love the display quality. Also, the display cut looks fantastic. So the Homtom S 17has a super quality display which will give you a high definition experience of graphics and animations. Talking about the LCD panel display which is mentioned above provides an eye with a relaxing view to the user, having an HD display. The display panel of this phabletHomtom S 17 is a tilt display with a high resolution of 640×1280, and the aspect ratio is quite good for a long watch of movies and gaming. The additional feature of this display is that comes with gorilla protection, just not the outer screen but the full show, and also of having a full HD display helps to have a complete view over al time. The phablet runs on a Quad-core 1.3 GHz ARM Cortex-A 7 CPU with clock chipset –Media Tek MT6580A,64-bit processor. Having such a fast processing unit in a phablet is quite good for running any programme, this processor the quad core makes it quite fast with its processing unit and part. Homtom S 17 runs on Andriod 8.1 which is the latest android upgraded version to work. The processing unit also helps to come up with the connectivity of many devices with it. The processing unit and the CPU which is used in the invention is quite good for doing multitasking and processing the advanced apps and feature. The Homtom S 17comes with 2 GB RAM. The configuration is high-speed and powerful with its processor. The transfer of data is smooth and fast and gives the phablet an excellent working speed. The external memory space is maintained well and is quite well useful while playing high-end games or working with heavy graphics. You will not need any external ram cleaning app for the device. The internal memory space of this phone is 16 GB. It is quite good in the manner for the phablet, but it is also expandable up to 128 GB. It can be done with the help of an external memory card. The phablet has an external memory card slot attached with it which can be used as a sim card slot also. Homtom s 17 being a good and fast smart phablet not help in playing games and high graphics video, but it is also good in other working task activity, this smart phablet rather a quick, smart phablet can replace the use of the laptop in your daily life with this fast processing feature. The device runs on the latest Android operating system Android 8.1 Oreo. The new OS has some useful features like its new ambient display, new cheese-burger emoji, redesigned power menu, new light theme, limit background activities. It is a balanced and stable OS and all its users like it. So the device will function well on it. The phablet has pre-built MIUI 9.6 user interface which is the latest one in HOMTOM UIs. It is highly customizable according to the user needs and can be readjusted easily. Plus it gives MI support and root accessibility. Now let’s talk about the most loved thing in a phablet. The camera.Homtom S 17has a brilliant set of cams. 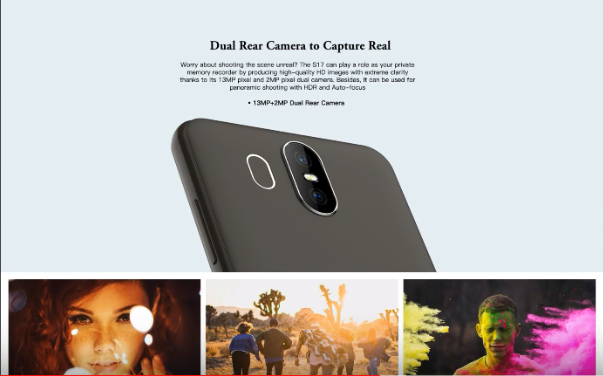 The rear camera is of 13.0MP with 2MP with the LED flashlight and AF rear camera consisting 8 MP front camera. The camera of this phablet is quite impressive as it allows it, user, to have a quite good experience of photography init, the front camera comes with a timer which is very useful for the selfies. As we know the trend has changed and people prefer selfie more over the other photography option, so keeping this in mind the company has built this camera feature in it. Talking about another prominent feature of this camera is it gives a good focus feature in which you can easily blur the background and click the photographs. Rather than going for any apps for editing the pictures you can modify your photos in this phone with its editing feature installed I it with the camera segment. One plus point about this camera is a phablet it provides you wide-angle photography feature and a night mode feature of photography, the filters provided in it is quite excellent and selective, which help the user to go for many other photography skills. The device has good connectivity support and a lot of options. It has a good wifi driver which is adaptive to 802.11 a/b/g/n support. So you can easily connect to wifi adaptors and hotspots. You are also able to create your own wifi hotspot zone name as a bridge for internet sharing and data transfer. The device gives you Bluetooth v 4.0 which is smooth in connection and can seamlessly connect to any audio or input/output device like a keyboard, mouse, speaker, headphablets, etc. Some apps can also use IT for data sharing. It also has OTG support and Micro USB support. It comes with a 3.5 mm jack for audio connections. Other connectivity options include IR sensors, GPS and FM. Talking about its Bluetooth connectivity it is quite fast and useful because it increases its speed of transferring and connecting with another device, talking about OTG and USB support it is quite comfortable and relaxed, The OTG connectivity with any device is quite functional and readable, even with another device. 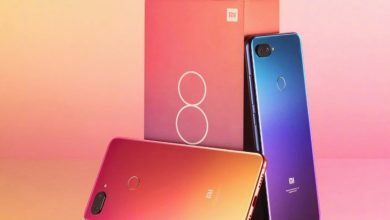 The device comes with a wide range of sensors like Face Unlock, 3D face recognition, fingerprint sensor, magnetometer, gyroscope, proximity sensor, ambient light sensor, and accelerometer. These sensors come handy in different situations like IR control, searching maps, easy unlocking, security, etc. Also, if we talk about the light sensor then it is quite good in that feature. Having a light sensor and gravity sensor in a phablet is quite good. 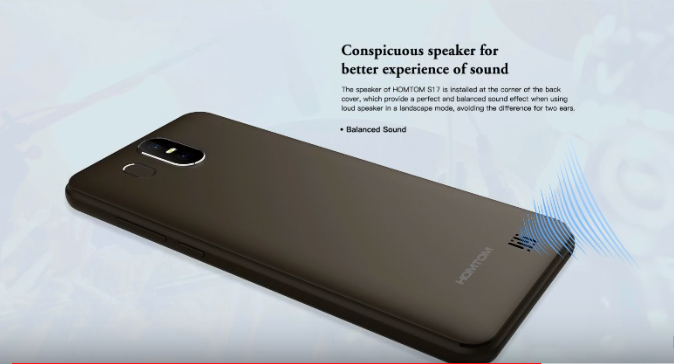 The phone also comes up with a useful security feature which is unbreachable, having a robust security feature is a plus point for any phone or technology company, and homtom S 17 is one such. 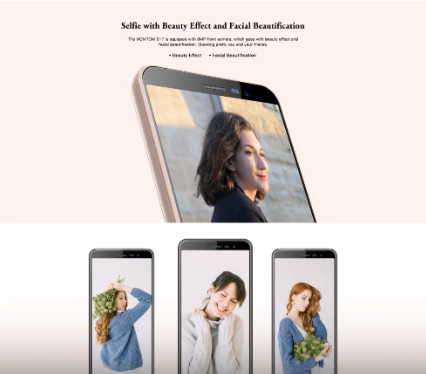 Talking about its face recognition and other unlock sensor feature, it is quite fast and secure, it just takes 0.2 sec to unlock the phone. Also, it also has a backup drive which keeps your password protected with google feature. Talking in detail about it it also includes a navigation feature which is offline and online. The device has a google play interface and consist of a micro USB slot. HOMTOM S 17 a Chinese brand phablet, basically a phablet of excellent and outstanding quality. To give a conclusion or overall verdict, I would say this phablet is unique and impressive with the work and feature. , and they would find it a bit easy and helpful by using this new technology phablet. Talking about the benefit of this phablet, it is very beneficial for the other sector person. If we talk about people or lady who lives in the house, then this device is useful for them also in any manner, like they wanted to watch a movie or to learn something through the internet than it would be quite easy for them. Phablet S 17 is the option which can replace the laptop. Replacing the computer sounds quite weird, but you can you that it is advanced and busy, they need things which are convenient to use, and phablet is one such option. 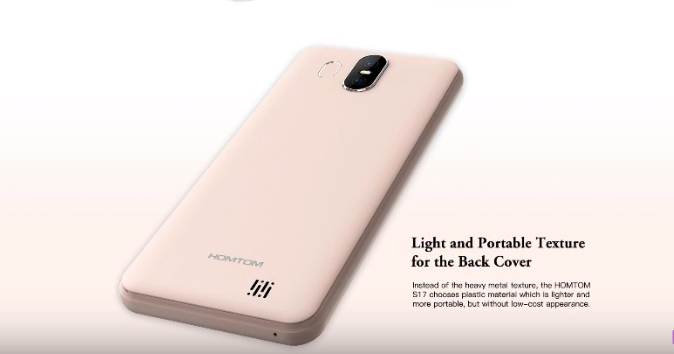 Homtom S17 is a phablet consisting all the feature of a laptop, rather some more characteristic of the computer. 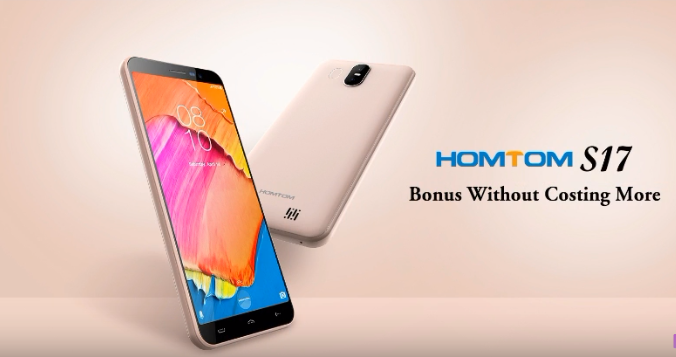 This additional feature of Homtom S 17 would make their customer quite attractive to buy this product. When we are talking about it overall verdict then why not to talk about its connectivity features, Homtom S 17 connectivity features makes it entirely different and a device to choose over to it. With all these features the phabletHomtom S 17 comes with an extreme amount of just $153.09. 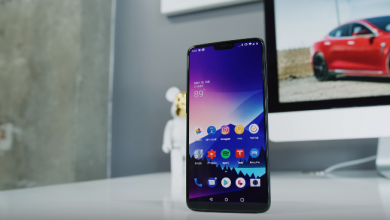 It is a justified price, and it competes with other phablet coming at the same range in the market and stands out as a better choice, just not the better choice but also a product worth money. The price makes it the best product to buy. As it has all the great feature and specification and cameras, the phablet is not an expensive product to buy. We can purchase this phablet from various places its such a popular phablet that it is available in thousands of international stores and websites. It is also available in all Chinese market situated all across the globe. Some popular sites selling this mobile phablet are Amazon, Alibaba, Flipkart,snapdeal, price boom, etc. It is a globalized sector’s product. So, any part of the world can enjoy the great essence of the product.